This is December 2012, Right???? This past Friday I went off with my two daughters and one of their friends to decorate a Rose Parade float again. I will be posting some photos tomorrow and will tell you all about it. But I had to tell you about something that happened while we were in Pasadena that just blew my mind! Really? Just because my child was a girl you figured she couldn’t possibly be an engineering student? Or maybe you wondered how was it possible that a school that was mainly for engineering (which it is not) could have a girl attending it? I am happy to report that I did not go all Mother Lion on him, instead we discussed the fact that Cal Poly has many majors and that many girls are in the engineering program. It is my sincere hope that he went back to his hotel room that night and told his wife how he stuck his foot in his mouth that day. And then she told him he sure did. That is what I hope happened. As a mother of two daughters, one of which is seeking a slightly less traditional education and career path, I am appalled that things like that still come out of men’s mouths. This is, after all, the last month of 2012. Wishing You All the Best at Christmas! For those who like that sort of thing, below is a link to a cute little Christmas animation, sent to me from my friend in Norway. Feel free to click on it and get a little Christmas cheer! 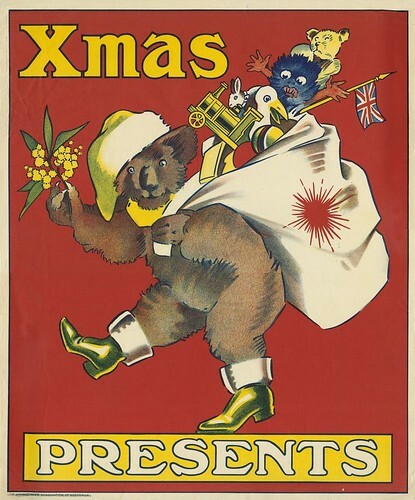 I have combined it with this cute Christmas koala from Australia. So my greetings to you this year are very international! I hope you have a lovely Christmas and I will return to posting sometime in the next week, when I get the chance to catch my breath! 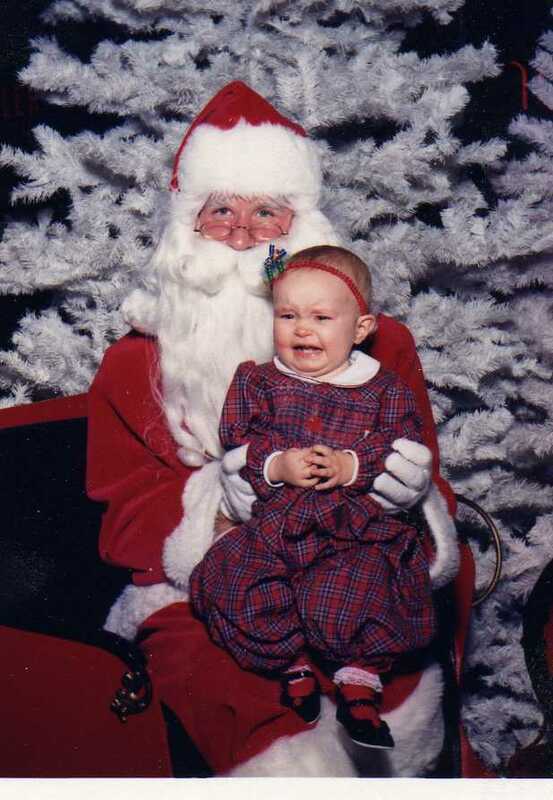 Nothing says First Christmas photo with Santa more than a crying baby! Eldest Daughter was born just a month after Christmas which is why she is so big in her first photo with Santa. We dressed her up in this pretty outfit that I had purchased at a store my cousin worked at in Memphis, Tennesse. My dear Eldest usually liked people so we were a little puzzled why she was so unhappy with Santa. A couple of hours later she threw up! We felt so bad that we had put a virus spewing baby in Santa’s lap! Eldest was always happy to see Santa after that, and we have the memories of that first visit to Santa! I hope this last weekend before Christmas sees you calm and not crazed, ready and not frantic, and all those other things I am NOT going to be this weekend! I have a small camera that I just love. I asked for it for my birthday a year ago and it has been great ever since. It is small enough that I take it with me most of the time in my purse. It captures great photos even in low light. I would tell you what brand it is but it disappeared. The case is still sitting next to my purse, so I know it is somewhere in the house. But where? I got a cut and color today and my wonderful hairdresser fixed my hair as she always does, so it looks really good. I can never make it look this good. I need a new photo of myself for something so I came home, slapped on some makeup, and told my Eldest to get her Richard Avedon on (famous fashion photographer). Then we couldn’t find the dratted camera. Last time we remember seeing it I was taking photos of the Christmas tree. I am seriously annoyed. I wanted a photo of my with good looking hair and Christmas is in a week, people. I need the camera!!! On the flip side, as I searched for the camera, I managed to find the long-lost check book. I am making myself sound like a horder, aren’t I? Really, I promise I am not. I do have a couple of “problem areas.” OK, I have four. The desk, the computer desk, the kitchen table, and the trunk at the end of my bed. But the rest of the house looks good most of the time and what makes it look not so good (pet hair on the floor) even at its worst could not hide a camera. So camera lost, checkbook found. That was my Tuesday! A city near me (which shall remain nameless but I do want to assure you it isn’t MY city) has a job opening. It pays $138,000 – $173,000 a year. What position are they trying to fill? Chief Innovation Officer! What the heck is a Chief Innovation Officer? I couldn’t help myself. I clicked on the link and discovered that this city is actually trying to find a replacement for the fellow who is retiring as the head of their IT department. Poor guy is probably just tired of the laughter and weird looks that he gets when ever he has to tell anyone what he does for a living. Of course, he probably doesn’t say he is the Chief Innovation Officer. He probably just says he is head of the IT Department. That is what I would do in his shoes. Brainstorm new and innovative names for various city positions such as Sludge Master (for the person running the sewer treatment plant) or Tree Guru (for the person in charge of trimming street trees). Come up with new and innovative names for city buildings. Maybe city hall could be called the “Tower of Dreams and Disappointments.” It sure turned out to be that for me when I worked there! That is all I have, folks! Can you come up with other job duties for a Chief Innovation Officer? I sure would like to see them! Of course, the title of this post is not entirely correct. I do have a few things to say. To ignore the horrible tragedy in Connecticut is impossible. But what to say? Too little in known at this moment to make any conclusions. We can all just hope that it is a very long time before something like this happens again, anywhere in the world. Now go hug somebody. I am sure they would appreciate it. While those of us living in the Northeast need foul/cold/hot weather gear for all seasons, you, my friend, only need one thing: A wind suit. I’ve chosen one in navy and white, but it’s got some nice lime green piping— which I think gives it a feminine touch! While shopping for your gift, it occurred to me that no Santa Ana wind suit would be complete without headgear. With the protection of your skin, hair, and eyes in mind, I have also chosen for you a lovely netted beekeeper’s hat! Obviously someone has been poking around my blog! What me, complain about those dratted Santa Ana winds??? Only a few dozen times a year! Can’t you just see me strutting around in my navy and white wind suit with lime green piping? Add to it the bee keeper’s hat and I will be the talk of the town! Mind you, they will be taking about how crazy I am, but who cares? I will be nice and protected in my wind suit and beekeeper’s hat!! The Festivus party hilarity continues when on December 21st they reveal who gave us our Secret Santa gift! Sometimes you have to wonder what is going on in someone’s mind…or is something NOT going on in their mind, like, maybe, thinking? I live in a nice area, by nice I mean it is pleasant, lovely views of hills and mountains, good weather most of the time. We are an area that has some neighborhoods that are older, a little run down maybe. We are by no stretch of the imagination a ritzy area so we are lacking in fancy cars for the most part. A few people have those ridiculously large Hummers, and there is a smattering of sports cars, classic cars, collectible cars, etc…but nothing really really expensive. So you can imagine that the police officer who was cruising down one of our older, lower-income streets was very surprised to see a 2005 Bentley. He called in the license plate and discovered, surprise surprise, that it was stolen. Because no one was going to notice a Bentley parked out in front of a house on that particular street. I feel pretty comfortable saying it was most likely the only Bentley in the entire city. When a couple of fellows came out of the house and hopped into the Bentley they were arrested for car theft. But it gets even more interesting. After one of the men posted a bond and got out of jail, he managesd to break into the impound yard where the Bentley was being kept. He then stole that car a second time and took it back and parked it in front of the SAME HOUSE where it had been parked before. It will not cause my dear readers any shock or surprise to learn that the police found that car sticking out like a sore thumb AGAIN and rearrested the same man a second time for stealing the same car a second time. I just can’t make these things up!